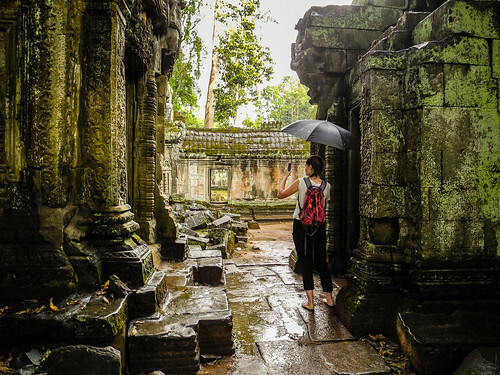 In January 2017, 17 graduate students spent two weeks traveling through Vietnam, Cambodia, and Thailand as part of a comparative marketing class led by Professor Clifford Shultz. Here, Quinlan graduate student Marcy Harman reflects on her experiences. Every January since 2010, students in Quinlan’s Comparative Consumer Behavior and Marketing in Emerging Southeast Asia have embarked on what has become a rite of passage in the MBA program. The class is an incubator for great relationships among students and also an opportunity to come to know yourself better, expand comprehension of global markets, and challenge how far out of your comfort zone you are willing to stretch. As a tourist, I have visited many other countries, but as a tourist I never got the same depth of understanding as I did from studying and working abroad. I could see that this class would be a uniquely rich opportunity to understand differences between cultures and economies at more than just a superficial level. These experiences are the reason I went. They embody Quinlan’s commitment to furthering social justice through business. It was plain as day to see how free markets help people thrive through better access to goods and services and through paid work. These experiences also illuminated the intricacies behind government policies and how they can help or harm the distribution of wealth. How far is Southeast Asia? On the way home I visited my brother’s family in Tokyo where he lives and works as an expat attorney. My Japanese in-laws surprised me with a question: “Do you think Japan is very far?” they asked. What they meant was that to some people, the distance is very far, and to others who have the resources to travel the distance does not seem so far. Our Cambodian guide had echoed similar sentiments. At one point, as we were passing through the floating villages, he paused and told us about his children, and that he earnestly wished his daughters “could be like you.” At that moment, the distance between our worlds seemed sadly and unjustly far. Why shouldn’t his children have every opportunity and security that we students enjoy? Only a small fraction of the world’s people could even dream of taking a trip like this. We students passed through national borders seamlessly, shuttled by luxury buses and staying in 4 and 5 star hotels. Travel is recreation to us, but for most of the world it is unthinkably privileged. Quinlan calls students to commit their learning to the good of society and the betterment of others. This is one course that will challenge you to think about how you can answer that call, and help bring other parts of the world nearer in distance, in understanding, and in opportunity. Watch students reflect on the life-changing experience of studying in Southeast Asia below or on Quinlan’s YouTube channel.